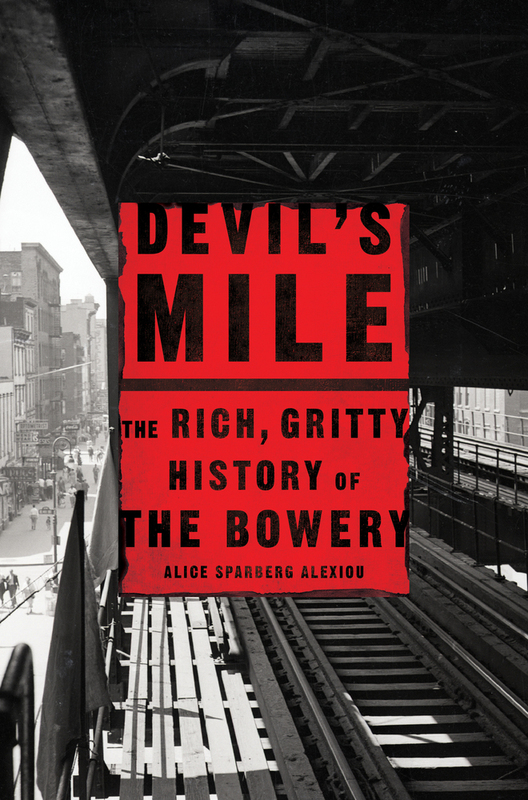 The New York Times Book Review: "Alexiou guides us through this checkered history with gusto." Kevin Baker, author of The Big Crowd: "Devil's Mile is a terrific read. Alice Sparberg Alexiou knows her history, and she brings it all brimming to life here in the story of the Bowery, the most notorious street in America." The Bowery was a synonym for despair throughout most of the 20th century. The very name evoked visuals of drunken bums passed out on the sidewalk, and New Yorkers nicknamed it “Satan’s Highway,” “The Mile of Hell,” and “The Street of Forgotten Men.” For years the little businesses along the Bowery—stationers, dry goods sellers, jewelers, hatters—periodically asked the city to change the street’s name. To have a Bowery address, they claimed, was hurting them; people did not want to venture there.